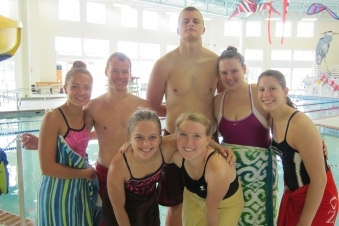 Learn to Swim at the Chaska Community Center! Here at the CCC, we teach American Red Cross swimming lessons. Our encouraging, caring and devoted swim instructors will help develop you or your child’s swimming and water safety skills in a fun and positive atmosphere. For questions about our swim lesson program, including level placement, please call the Aquatics Coordinator at (952) 227-7746. Not sure what level your child should be in? Call for a free swim assessment 952-227-7746. Enjoy swimming with your child and learn fundamental safety and aquatic skills while having fun! Enjoy swimming with your child and learn more advanced safety and aquatic skills while having fun! This class is for children who are ready to explore the water independently of their parents. Swimmers will learn to feel comfortable in the water and enjoy the water safely. All participants need to be fully potty-trained, able to separate from their parents and able to follow directions. Curriculum will match Preschool Level 1. 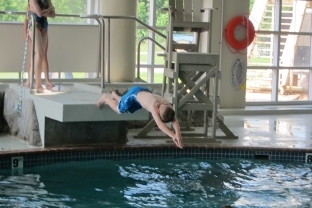 Preschool swimmers learn to feel comfortable in the water and enjoy the water safely. Fundamental aquatic skills are taught to develop good swimming habits and safe practices in and around the pool. There are no prerequisite skills for this class. 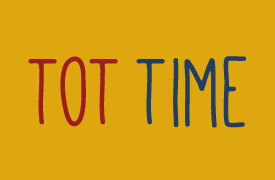 REGISTRATION TIP: Students that pass Preschool L1 and are under the age of 6 should register for Preschool L2. Students that pass Preschool L1 and are age 6 and older, should register for L2. REGISTRATION TIP: Students that pass Preschool L2 and are under the age of 6 should register for Preschool L3. Students that pass Preschool L2 and are age 6 and older, should register for L2. Increase proficiency and build on the aquatic skills learned in Preschool Level 2 by providing additional practice with increased distances. 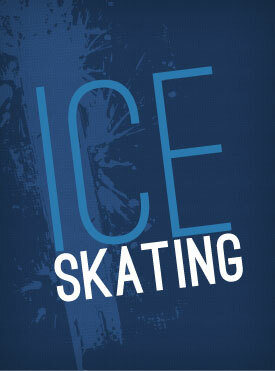 Skills in this level are performed independently. Prerequisite: Students must have completed Preschool Level 2 or have equivalent skills. REGISTRATION TIP: Students that pass Preschool L3 and are 6 years old should register for L2. Participants learn to feel comfortable in the water and enjoy the water safely. Fundamental aquatic skills are taught to develop good swimming habits and safe practices in and around the pool. Prerequisite: Students must be at least 6 years old. This level marks the beginning of true locomotion skills. Students are performing skills without support and developing arm and leg actions that lay the foundation for future strokes. Prerequisite: Students must have completed Level 1 or have equivalent skills. Increase proficiency and build on the aquatic skills learned in Level 2 by providing additional practice with increased distances. Prerequisite: Students must have completed Level 2 or have equivalent skills. Participants improve skills worked on in Level 3 and endurance for front crawl, back crawl, elementary backstroke, sidestroke, and breaststroke. Prerequisite: Students must have completed Level 3 or have equivalent skills. Participants refine their performance of all the strokes and increase distances. Prerequisite: Students must have completed Level 4 or have equivalent skills. Participants swim strokes with more ease, efficiency, power and smoothness over greater distances. Prerequisites: Students must have completed Level 5 or have equivalent skills.